Some notes on Playing a Mage in the NWN Official Campaign. I made her an Evoker. An extra spell per level, but you lose “Summoning”. I have never played a wizard under wither V2 or V3 rules, and it’s really changed. I need to check up on the offence, defence, buffing, protection and counterspells. About the specialisation, despite losing summoning, neither Shades nor Mordenkian’s Sword are summoned, it would seem. This article contains broken Bioware links. It looks like you must take a fighter as henchman (Daelen or Grimgnaw), and I’m using a Pixie as familiar to get the thieving. I may change later for chapters with less thieving required, but I like the Pixie. get some potions of Bull’s strength to do Halueth Never’s tomb, as a wizard, you’re unlikely to be able to carry the treasure otherwise. The first time through Eltoora’s automaton was very hard; I was being very thick. The 2nd time through with a bard, I discovered the UHS hint file cheese. When you get the quest, Eltoora gives the reagents you need to collect an order, this is not about the order to collect them. The final level of Helm’s Hold is difficult as a Wizard. I started a Bioware thread here…, and Xenshail of RPGdungeon pointed me at this and this, both at Bioware. The first of these is quite long and detailed and discusses potions and cheating, the second not so useful as it focuses on the ‘Ritual Creatures’. This thread at Bioware forums documents how to rest on the top floor. I didn’t think this was possible. 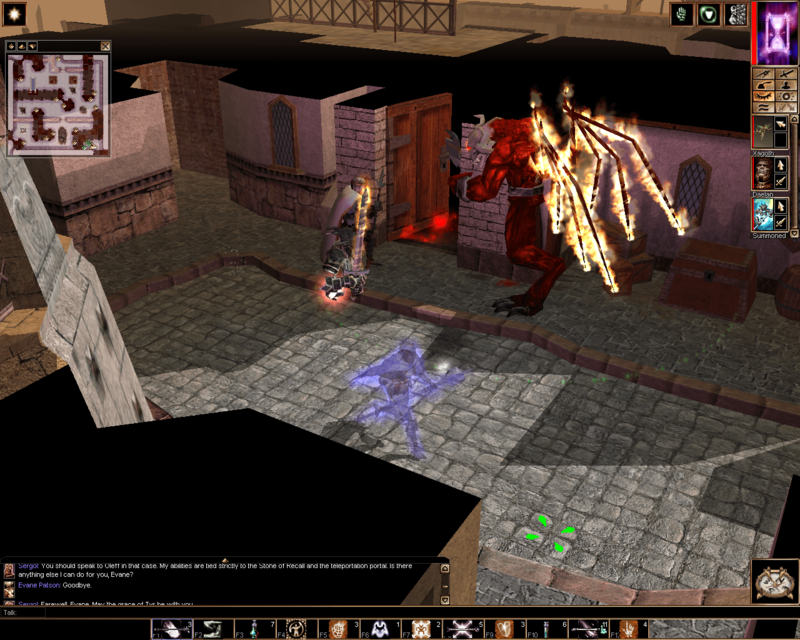 So once I learned how to rest on the top floor, it became much easier, this thread at rpgdungeons describes what I did. Make sure all your spell slots are full, and take dismissal for the Skeleton Chief. Use protection from elements sensibly i.e. on the target for Desther’s flame strike. Use the area effect damage causing spells on the ritual creatures and then you’re there.I used the forge to create some armour and the ‘Harbinger Kin’ greatsword but I wonder if I should have kept one of the diamonds for Chapter 3. About the picture above, I used an ipodtouch running VNC to take the picture to prove it was possible and blogged about it on my sun blog and posted it to flickr so others could admire it. You can’t repeat Eltoora’s recipes in her Lab. buff myself and the party including potions of clarity, any protection against elements and maximise various anti-magic protection using the Many Starred Cloak, Scarabs of Protection and I had a Protection against Elements & Spells scroll. (The latter I avoided using in the last fight.) Dealan wore a Scarab of Protection, not an amulet of Armour. take a shed load of Dispel Magic scroll spells and use these on the Zombie Lords but most importantly on Brother Toras. His protections will be dispelled and Dealan can then hurt him, sadly the AI is such that he doesn’t use the potions to stay alive. Some people on the Bioware board, suggest that you try and lure them out one at a time, but I couldn’t make this work, they were too clever for that, maybe the AI enhancement mod. Also, the summoned Shadow was pretty useless against the Zombie Lords, it used a negative energy attack, which wasn’t good, but it did delay some of the other undead for about 2 secs.I have now entered the Host Tower. The 4th Level with Rimardo Domine, which I have always found very hard as a fighter type was really easy, I buffed up my Mage with Protection from Evil, Ghostly Visage and Mage Armour and by the time I entered his sanctum the Iron Golem had been destroyed by Golem from the summoning chamber. Electricity spells to kill the henchmen and Mordenkian’s Sword to protect me from the elemental, by the time Rimardo attacks, its simple to use a Dispel Magic to remove his protections and Dealan just does the rest. I wonder whether Mordenkian’s Sword scales with the caster. 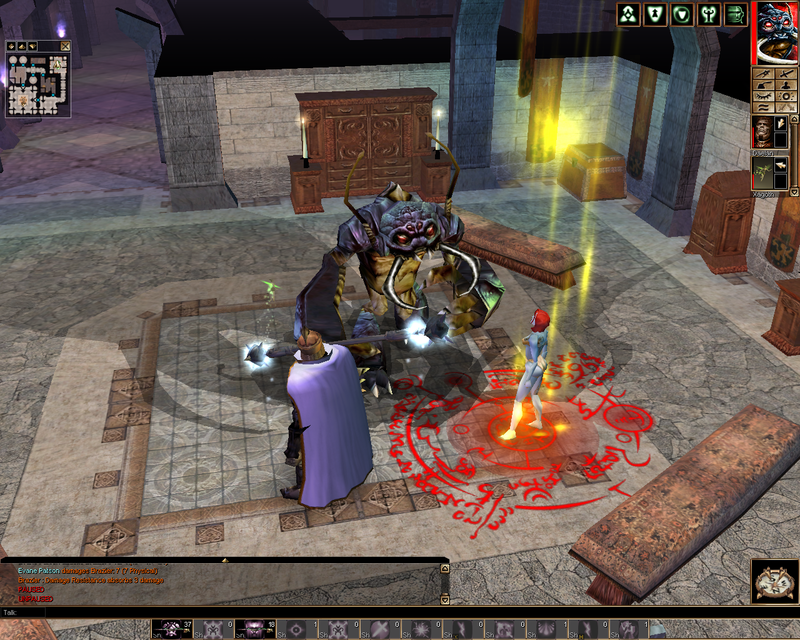 I also had fun on the 5th level, where I had difficulty destroying the magical brazier that imprisons Nymphithys; a mage’s strength is too poor to bash the brazier. I polymorphed into an Umber Hulk. The Battle Devourers seem much easier as well. Dealan seems to be a monster, and when working with Mordenkian’s sword they do a lot of damage and most importantly, hit it often. I think he used a potion of speed as well. Memorise “Dominate Person” or take a scroll before exploring the Wizard’s Lab. Eltoora sells a Rod of Beguiling. In the Creator Ruins, the Old Ones have some form of Magic Resistance….this needs a knowledge of the spells that have no saving throw as Magic Resistance is implemented as Save = Yes. I found that Finger of Death got through as does Phantasmal Killer. Some of the saves are will and reflex, and I am not sure how MR helps these. At some point around here I got Bigby’s Clenched Fist. During chapter 3 and chapter 4, I moved towards my favoured style, which is why I chose an evoker. I like spells that do a shed load of HP damage. I have been taking maximised cone of cold, prismatic spray and bigby’s clenched fist, which is great against spell casters. I am a bit short of dispels and dismissals, for defence I use etheral visage and stoneskin, it’s been enough for most of the chapter. The Balor went down fast; aid, bless, Dealan hasted, Mordenkian’s Sword , Prismatic Spray, of course but Dealan mainly. And we finally reach the source stone. The magician’s controlling the war golems were a bit hard, as are the Old One’s with Magic Resistance inside the Source Stone, Polymorph and Tenser’s Transformation work there. The key here is to preserve magic capability for the final encounter. The game goes through some easy stages and then some harder stages. As ever mixed parties of class aquiring monsters, drow, humans, and dark dwarves are hard. I have not often played higher level dungeons before and so moving through the effectivness of a spell’s use is new. For instance Fireball is great when you first get it, but as you meet monsters with more Hit Points, and resitance to magic and fire, it becomes less usefull. The empowered and enhanced spells help extend the useful life of these spells, but the new spells always seem so useful. Does Fireball have a level limit? The scrolls, wands and spells should. Some fights are set up to be hard for a Mage and some to be deadly for the Henchman. One of the best spells I have not used before in NWN nor PnP is Bigby’s Clenched Fist. It both Kills and Immobilises, but only one character. It seems that you must build a flexible spell book; my preference for the use of mqassive energy disruptions is limited and the authors of NWN seem to create a bunch of balanced and differing monsters. Too many undead to rely on enchantment, some of the ‘bosses’ require exotic death magic. Any way a challange for me! know when to hold ’em, know when to fold ’em, know when to walk away and know when to run. i.e. to know when to maximise defence, and when to maximise offence. The mage is a bit poor on defending the party, I have become over reliant on potions of aid and bless. (I think I have failed to learn and use Bull’s Strength and the Consitution enhancing spell.) In this party, we have only potions for healing.